Seethal Meda, a graduate of the biotechnology certificate program at Montgomery County Community College, points to test results confirming deletion of the frataxin gene during a process she conducted for her research internship. “Quite often employers want new hires to have six to twelve months of industry experience, which would of course exclude new graduates. These internships have provided industry-relevant experiences that a graduate can include in a job application and discuss at an interview,” explained Margaret Bryans, principal investigator of NBC2, which is hosted by MCCC. Bryans said the curriculum, which NBC2 developed with ATE support, prepares students for careers in the biopharmaceutical field and brings them to a level to take on these real-world research projects. The specialized work that Meda did with mouse embryonic stem cells was informed by the Scaling Implementation of Stem Cell Technical Education project. 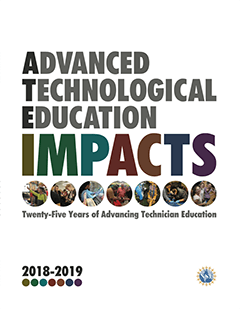 This ATE project, a collaboration between biotechnology faculty at Madison Area Technical College (Madison College) in Wisconsin and City College of San Francisco in California, teaches complex stem cell technology skills to educators using curricula that both colleges developed with prior ATE grants. In the summer of 2015 Bryans attended a faculty workshop led by Thomas C. Tubon, the principal investigator of the Stem Cell Education Initiative at Madison College. Since then Bryans has integrated the project’s stem cell lessons into the biotechnology research course at MCCC. More recently she leveraged the enhanced research course and NBC2’s other ATE-funded resources to obtain a Leading Women in Philanthropy grant from MCCC’s foundation. This grant funded Meda’s paid internship through the College-Company Connection Student Internship program that MCCC has offered for several years to graduates of its biotechnology certificate and degree programs. Research project internships performed in collaboration with local biotechnology companies appeal to Bryans because they provide real-world experiences for community college students. “Skills and knowledge from coursework are reinforced as students work on an industry project, guided by company scientists,” she said. Bryans has found that when students generate, document, and analyze data, and then report their findings to the companies it increases the students’ communications skills, confidence, and work readiness. The research question that Meda worked on and the mouse embryonic stem cells that she used were provided by Chondrail Therapuetics, Inc., one of four biotechnology companies that have participated in the College-Company Connection Student Internship program. Meda investigated the role of the frataxin gene in mice neuron cell development and its involvement in Friedreich’s Ataxia, a rare inherited neurodegenerative disorder. Chondrail, a small biotech company, is working on a biopharmaceutical to treat it. Meda earned a bachelor’s degree in biology in 2001, but has been a full-time parent since. She enrolled in MCCC’s biotechnology certificate program to refresh her knowledge and update her skills. She excelled in her courses and is currently applying for jobs with biopharmaceutical companies located in Montgomery County, north of Philadelphia. Meda says she now feels ready to start her career. “It’s all because of Dr. Bryans. She’s given me lots of confidence,” Meda said, referring to classroom lessons and her internship experience.